Repeat purchases are the lifeblood of any high-performing retailer. So it’s no surprise that efforts to increase repeat purchases are of vital interest to marketers at the largest and fastest-growing brands. 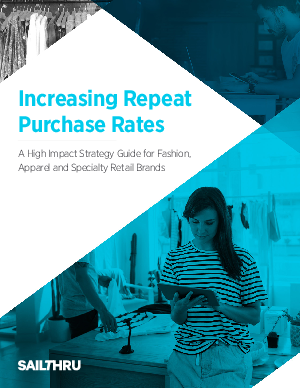 According to a Q4 2015 Sailthru customer study of over 125 leading retail brands, 57% of marketers say that increasing repeat purchase rates is a crucial goal for the year ahead. To help online retailers, Sailthru’s team of digital marketing strategists have compiled high-impact strategies and best practices for increasing this critical metric.